A Cooler Looking Spare Tire? Personally, I’d rather wait for a flatbed tow-truck to take my car in style than put on those cheesy little spare tires most cars come with. However, I just found out that Ameritre apparently accomplished a “major technology breakthrough” with their attempt at the spare tire game. How you ask? Well, they are using this new-fangled proprietary polyurethane elastomer compound. Since the spare has no air, you’ll never be stuck with a flat one (most air based tires lose one or two pounds of air per month in cool weather, and even more in warmer weather — this is a good time to check yours!). 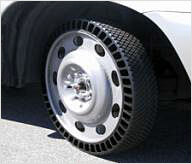 The Amerityre temporary/spare tire can carry a load up to 1,250 lbs. Now, this is a spare I wouldn’t mind showing off!